Consensus projections are that Barack Obama has won the 2012 presidential election! With the majority of states reported, Barack Obama has locked in 275 electoral votes to Mitt Romney’s 203. As you know it takes 271 electoral college votes to win. Interestingly enough, Mitt Romney leads the popular vote as of this moment, 45,899,639 to 45,709,932. If Romney’s general vote lead holds up this will be the second time a president was elected by winning the electoral college but losing the general populous vote. Congratulations to President Obama. Let’s make positive changes over the next four years! 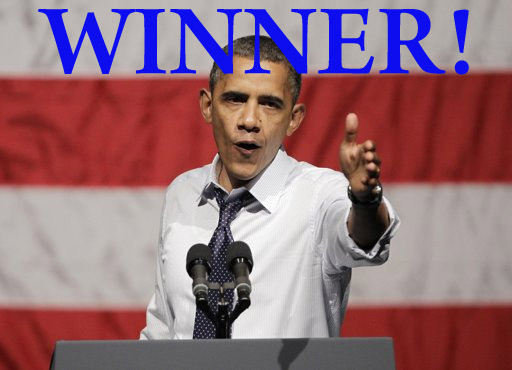 2 Comments on Obama Wins Election – Four More Years! Obama is an arrogant self-centered negative man. His 8 years were a disaster. His only way to deal with life, politics and his life in general is by putting others down. He can talk about his achievements because there were none. His Pulitzer award was bought for him. Just like everything he & also negative wife have. He is rude, arrogant and should go hide in shame.